I am still pretty much a noob when it comes to living in Los Angeles. I’m still learning city traditions and rivalries. One foodie rivalry that I picked up on quickly is between Philippe the Original and Cole’s over who was the first to make the French dip sandwich. Two of my favorite foods are French dip sandwiches and lamb. My friends all know that if there is lamb on a menu then that is what I will be ordering. So, I when I saw that Philippe’s had a lamb French dip on their menu there was no question that I would be checking them out. I did and the sandwich was tasty but what really made my foodie day was an unexpected treat that, I am sure, most folks in Los Angeles would skip right by. I am Pennsylvania Dutch by heritage on my mother’s side. I grew up in the suburbs of Philadelphia where Pennsylvania Dutch inspired cuisine is very much part of the food culture. Supermarkets think nothing of stocking sauerkraut, whoppie pies (Don’t make me argue with you New Englanders. They were ours first. ), shoofly pie and all the rest. It wasn’t until I grew up and left home that I realized just how regional so much of the food from my childhood had been. One of the food items that I have nearly never seen outside of Pennsylvania are red beet eggs. 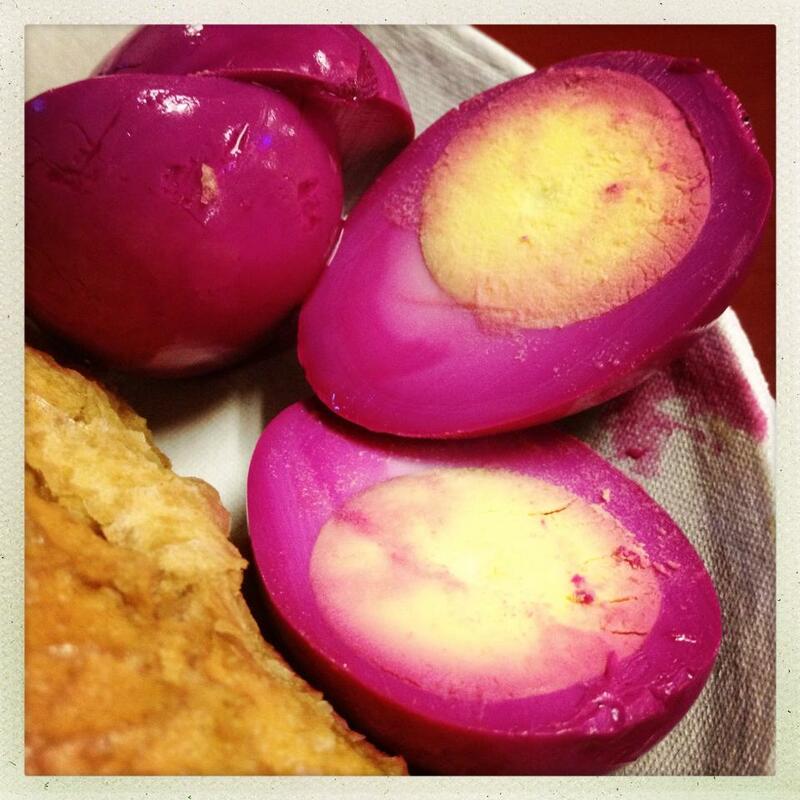 Essentially, they are pickled eggs which are done in a brine that includes red beet juice. As as result the eggs turn a vibrant purple color and take on a tangy flavor that I have always loved. 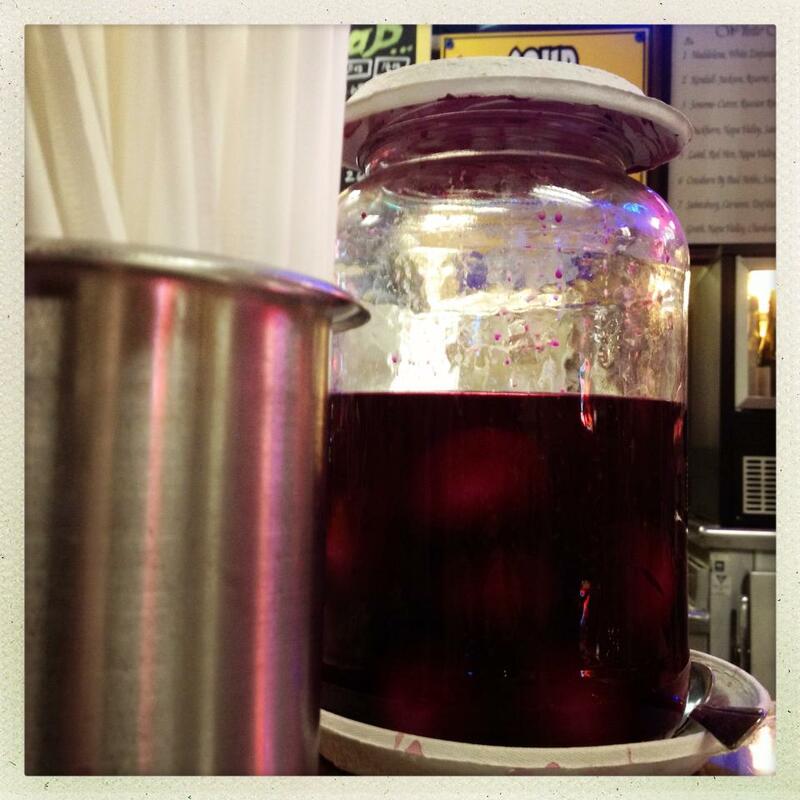 When I went to the counter to place my order at Philippe’s, I was surprised to find this jar of eggs in the tell tale purple liquid. Suddenly, I cared much more about the eggs than I did the tasty sandwich. Honestly, I can’t remember the last time I had a red beet egg and it certainly wasn’t in Los Angeles. So, my order was the lamb French dip and two red beet eggs so that I could confirm they were what I suspected them to be. I sliced one of the red beet eggs open and was thrilled to see that bright yellow yolk contrasting against the purple. Indeed they were the real deal and I became a very happy (not so) little Dutchie girl in Los Angeles. I need to go back to Philippe’s and pay better attention to the actual French dip before moving onto Cole’s so that I can pick my French dip team and take a step closer to feeling like a Los Angeleno. This entry was posted in Eating Out, Eating Out In Los Angeles and tagged Pennsylvania Dutch. Bookmark the permalink.